If you’re trying to set up a desk in a dorm room you have to be smart about the space you use up. That usually means working solely on a laptop and all of your other gadgets need to do double duty. This POD Lamp might be worth adding to the list of gadgets to pick up before August comes around. 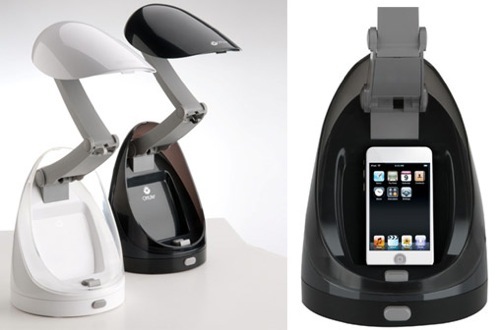 The light moves to all sorts of angles, plus it can hold and charge your iPod within the base of the light. The base also helps with cable management since the cord for your MP3 player of choice just slips through the bottom of the lamp. It features a 13 watt bulb that is said to last up to 10,000 hours, so it should last through any studying you might do throughout the year. The light itself can function at multiple heights and angles, you just have to find the one that works for you. You can purchase one of these for $69.99 through OttLite.